This is the basis of my belief system. A synchronicity poem, written about breaking free from abuse. All entries must be posted by b-item or entry links only. Photos posted directly in the message forum will be disqualified if not fixed by the end of the week. This contest is for photos. However, a small piece of related writing will be required along with it. Writings may be short descriptions, poems, short essays, or short story. Entries must consist of one photo, taken with a camera and edited no more than cropping, and a short writing no longer than one hundred words for descriptions, essays, or short stories OR ten lines for poems. Entries which exceed their word/line count will be disqualified if they are not fixed by the end of the week. Photos MUST be WDC rated ASR or lower, although short accompanying writings may go up to 13+. Entries may be edited up until the deadline, which will be posted in the forum, but not during the judging process. Only new photos and writings, please. Your entry must incorporate the current prompt. Photographs MUST be taken by the author entering this contest, and short writings MUST be the author's own work. 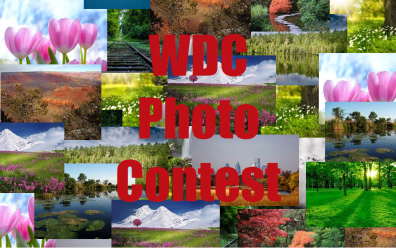 I'm sorry, but this contest is only open to authors with an Upgraded or higher paid membership, as you have to have one to put images on WDC. Exactly SEVEN entries will be allowed. After that, judging begins immediately. Judging will not begin before the arrival of the seventh entry, and only the first seven entries will be considered. NEW RULE: No people's faces in any entry. Any entries not following the rules will be disqualified. Rounds run from the first day of a new prompt up to the seventh entry for that prompt. Honorable mention(s) may or may not be awarded. Judges' decision is final. Anyone who donates 30,000 or more gift points for this contest will get a merit badge of the donor's choice. If a merit badge is not specified WITH the donation, the “Generosity” merit badge will be given. Your photo should include something wintry. The hustle and bustle of Main Street comes to a stop. #2180543 by eyestar~Go Power Raiders. "Christmas Trees in the Air"
"The One Book to Rule Them All!" "A Fire in the Sky"
"ruwth writes on WdC (and A Lone Cow Under The Trees)"
"Here's a photo of my dog Dottie Ruth"
"No Whining ... or is that Wining?" "The Whole Kit & Kaboodle"
Have fun writing and picture-taking! Re: Re: Re: Still going? Generated in 0.69 seconds at 12:52pm on Apr 20, 2019 via server WWW2.